Light. Durable. Checkpoint Friendly. The perfect business companion for the pro on the go. The Executive Pro™ briefcase collection from Travelpro® brings sophistication and functionality to the frequent business traveler. Within this collection, road warriors will find exactly what they are looking for—lightweight, durable and Checkpoint Friendly briefs that make travel easier. A host of innovative features delivers what every busy executive needs on the road. 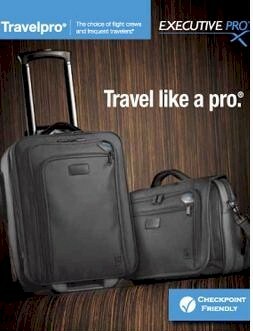 Also all Travelpro Luggage pricing includes Free domestic shipping and more. No sales tax if shipped to anywhere outside the state of Michigan. On-line ordering is of the highest level secure format. We have been in business for over 50 years and offer 30 day Money Back Guarantee. We also stock and ship out immediately. All Travlepro pieces are backed by Manufacturer's Warranty. We also can gold hot stamp your initials at no extra charge, just specify desired initials under "Special Instructions" when placing order.